Term Life Insurance is a broad category of insurance built to control your costs for a specific period of time. "Term" refers to the amount of time that your rates are guaranteed. To for example, Term 10 Life Insurance would guarantee your rates for ten years; Term 20 Life Insurance would guarantee your rates for 20 years, etc. 2. To cover an insurance cost that will go away over time. For example, using a Term 30 Life Insurance policy (or T30) as Mortgage Insurance, with the the idea that in 30 years your mortgage will be paid off and you won't need that insurance any more. For those who are later in life and want to guarantee their rates, we also have access to Term 100 Life Insurance that will guarantee your insurance costs for the rest of your life. Because let's face it. You will die. What if that happens sooner than you expect? What happens if you get hit by a bus? We use the "bus" analogy because it's random. It comes from nowhere. It's hard to see ourselves dying from cancer, or getting in a fatal car accident, or any other number of ways people die ALL THE TIME. Because we can't put ourselves in that picture. But let's say you did. What would happen? What if your spouse died? Would your family be able to stay in their house? Would they have the cash on hand to pay funeral expenses (around 10K)? Would what you have saved cover all the experiences you'd want to be able to give your kids? If the bank came calling for the mortgage, what would your family do? Yes, as a teacher, you have some insurance through your school board benefit plan. Typically two times your salary. Is that enough to cover all of those things? Will you leave your family struggling financially as well as mourning? As a part of your ATA Voluntary Benefits, members of the Alberta Teachers Association and their spouses can sign up for very simple insurance to help fill in those gaps. Rates are guaranteed for the term of the policy and many policies can be converted later to a permanent policy. And unlike the insurance you buy from the bank (sometimes called Creditor Insurance), you own this policy -- which means your heirs get to decide what to do with the money. With bank insurance, you pay for it and the bank owns it. Makes sense, right? Well, it does ... to the bank! Question: So if it's the cheapest insurance available, why doesn't everyone use it? Answer: Good question! We said it was the cheapest in the short term. The one catch to Term Insurance is that at the end of the guarantee period, the price generally increases dramatically -- an increase of 500% isn't uncommon. So a lot of people will choose to either go with a Permanent policy from the start, or plan to convert their Term policy to a Permanent one down the road. As well, Permanent Insurance can build up cash values that can be used for other purposes (as a policy loan, for long term care or to take a holiday from premiums, for example. With Term insurance, you have to keep paying your premiums or your policy will expire. 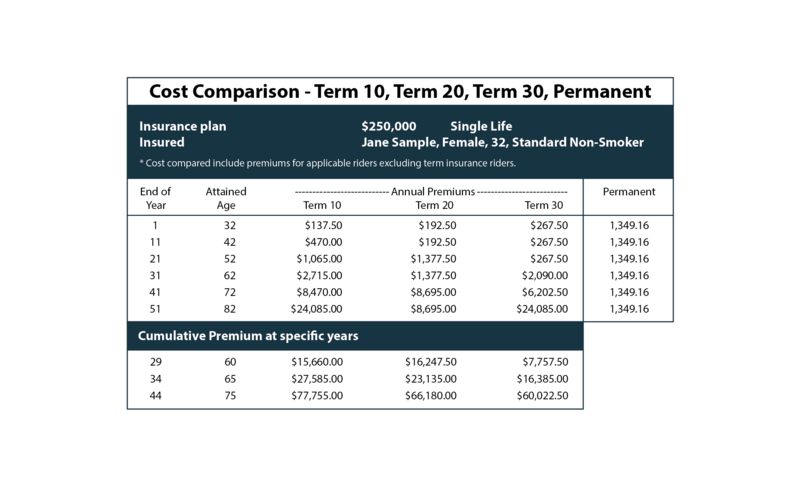 Question: What's the difference between Term 10 Life Insurance, Term 20 Life Insurance and Term 30 Life Insurance in terms of costs? Answer: Term 10 will be the least expensive in the short term. But because of renewal costs longer guaranteed terms often end up working out better in the long run. Contact us today to find out how to simply and inexpensively protect your family. Term Life Insurance is affordable insurance that has guaranteed rates for a set period of time. Permanent Life Insurance is insurance that you own, instead of insurance that you rent.